I know you’ve been waiting anxiously for another round of pictures (see Part 1). So here they are! I also asked my dad to find out what the Chinese characters (百鸟朝凰) at the top say (he’s been learning Chinese for fun). The answer is super interesting! 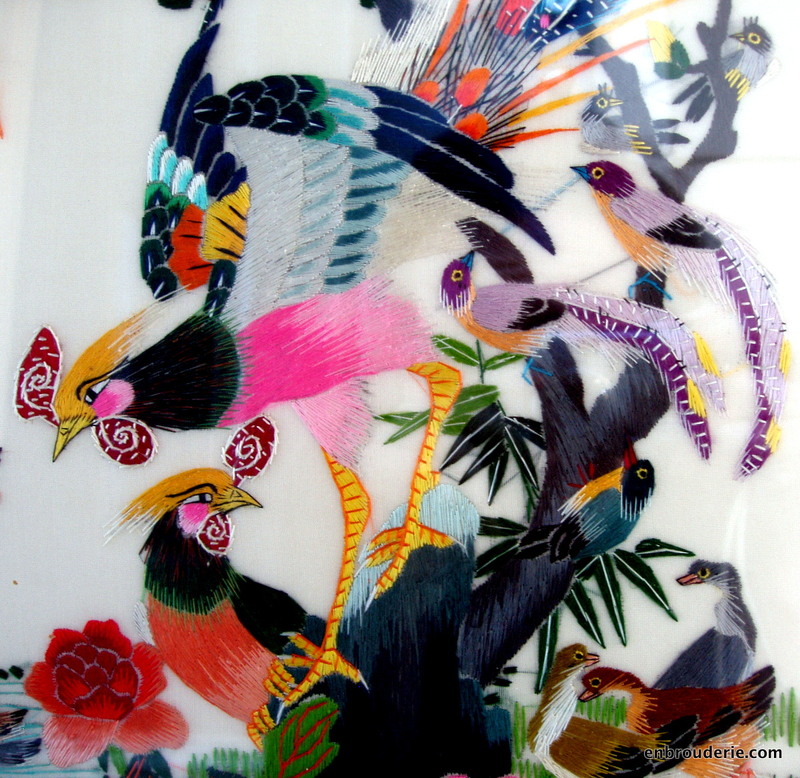 The bird with the enormous tail feathers is a female phoenix, a huang. You can check out FengHuang in Wikipedia for the Chinese legend of the Phoenix. These characters are an ancient saying from the Book of Tang, which was presented to Emperor Chudi in 945 AD. The saying means that some one is very virtuous and highly respected by people (like the birds look up to the phoenix). This is a traditional subject in Chinese art (example photo: phoenix sculpture in the Forbidden City in Beijing). 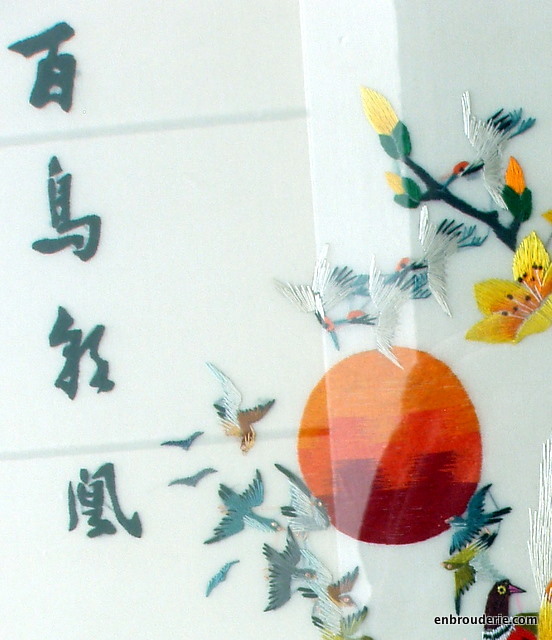 It’s a happy symbol and also the name of a traditional folk song, often played at weddings and New Year celebrations. And now, more photos! Come back next week for close up photos of the birds near the ground. 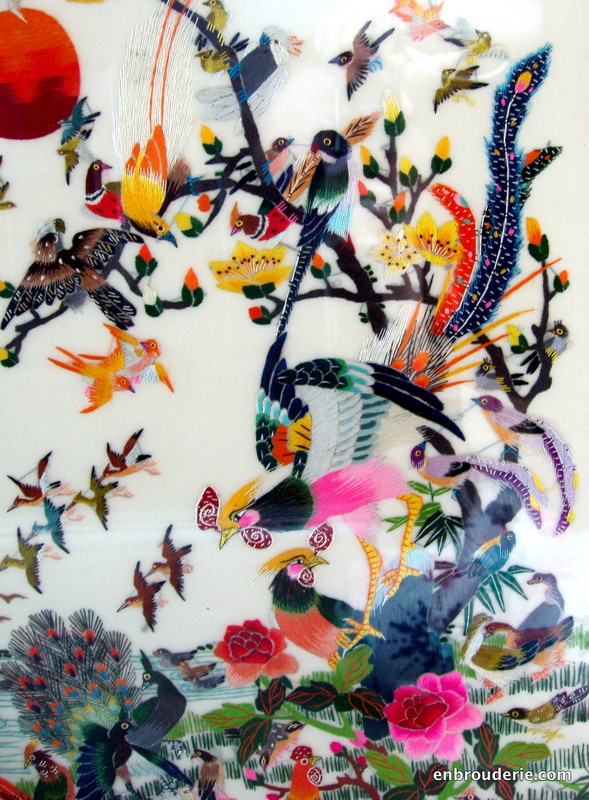 If you are impatient, here is the link to the Google Image search for 100 Birds Adoring the Phoenix (lots of beautiful photos). 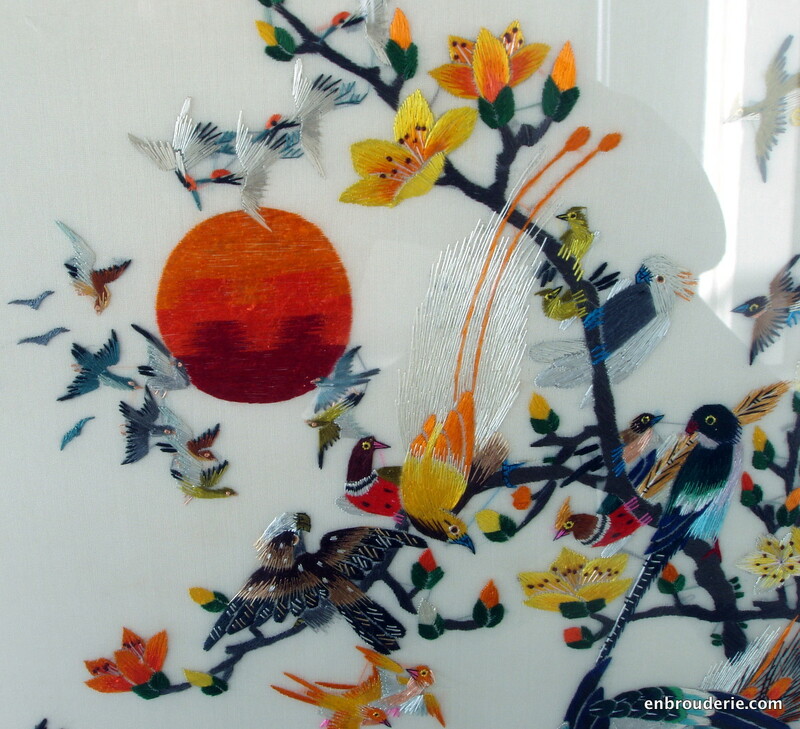 This entry was posted in Embroidery around the world and tagged Chinese embroidery, 百鸟朝凰, embroidery, hundred birds, phoenix, silk, 刺绣. Bookmark the permalink. 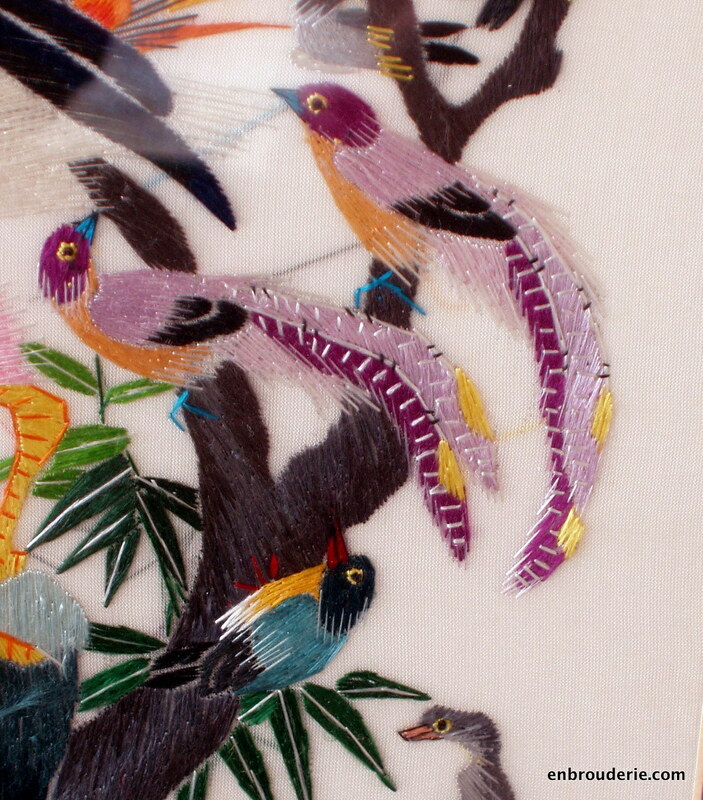 Everything in this embroidery astonishes – the mastery of color (primaries plus variations), the composition of the design itself, the stitching (details of birds’ wings for just one example)! And I particularly like the treatment used to achieve the bark on the tree; you could say it is a secondary element in the overall design, but in fact it anchors the whole composition. Thank you for sharing. Thanks, too, for the explanation of the Chinese characters. It explains the embroiderery’s “reason for being”. I like studying the birds to see how they were worked. I may try to duplicate a few in floss, like the orange pair at the bottom, to see if I can get similar effects. 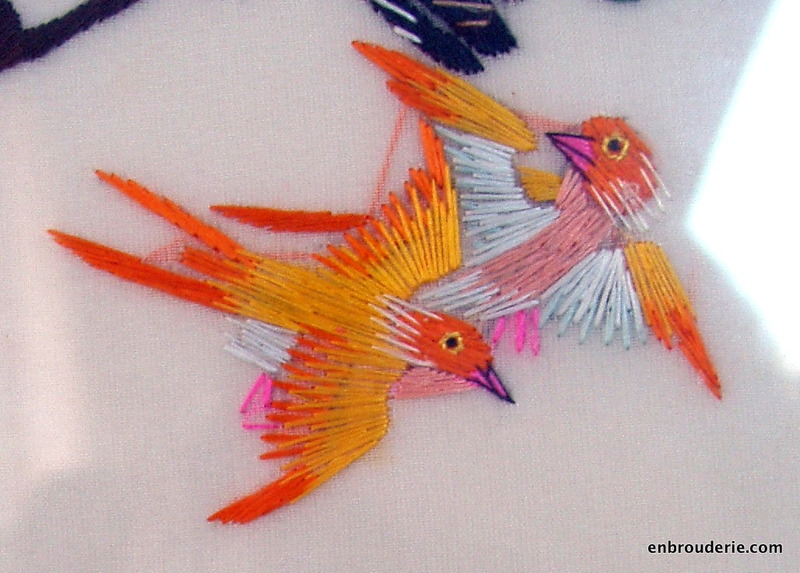 Makes me think of a Persian story, “The Conference of the Birds.” I admire how you connect the historical to your passion for fiber arts. In learning the art we seem to loose sight of our connection to history as we strive for technique. You provide a nice balance! Thanks!